In the Great Depression (1929 – 1940), money was so scarce that local communities made coins out of wood with various denominations and the names of local merchants stamped on them. These could circulate in exchange for goods and services at participating merchants. It was really a form of credit, but it served to keep economic activity going when it might otherwise have ground to a halt. Yet, it was a non-sustainable system, and the phrase, “Don’t take any wooden nickels,” came into parlance as a warning. Today’s version is found in Zimbabwe. 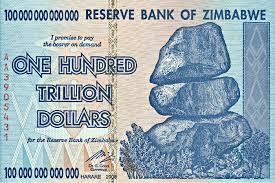 Most readers are familiar with the 2008 hyperinflation in Zimbabwe that led to the introduction of the “$1 Trillion” note, which was not enough to buy a loaf of bread. Zimbabwe then moved to a U.S. dollar based economy because it had no trustworthy currency of its own. Now that dollars are in circulation, the government is trying a bait-and-switch scheme in which Zimbabwe “bond notes” will be introduced as “equivalent” to dollars on a 1-to-1 basis. Locals aren’t falling for it and are pulling their hard currency out of banks as fast as they can. Click here to see how the government is fighting back by going to a “cashless society” and limiting the amount that can be withdrawn from banks and ATMs. This trend will spread as governments realize the only way they can confiscate their citizen’s money is by outlawing cash, and forcing citizens to use digital money at approved banks.